We begin with the Samsung Galaxy A3, the smallest and the least powerful of the phones announced. There are differences in the screen sizes, battery capacity and performance. The Galaxy A3 comes with a 4.7-inch display, 2GB of RAM, 16GB of storage and a 2,350mAh battery. One of the biggest differences is in the camera, with the Galaxy A3 featuring a 13MP rear camera and an 8MP front camera. The 13MP camera was also part of last year’s edition. The Galaxy A3 is the smallest and least powerful of the three phones, so the price will be a little lower than the other two. The company has not announced the prices for the phones but tech sites have recently reported that the Galaxy A3 will cost around $300. Samsung did announce that the phone will be available for pre-order starting January 20. The Galaxy A5 is a little more powerful and bigger than the Galaxy A3 but not as big as the Galaxy A7. The Galaxy A5 has a 5.2-inch display, 3GB of RAM, 32GB of storage and a 3,000 mAh battery. A big difference between the Galaxy A3 and the Galaxy A5 is in the camera, which is a 16MP rear camera and a 16MP front camera. The price of the Galaxy A5 has not been announced but it is said to be around $440. Last year’s version also has a 5.2-inch display but the RAM and cameras are different. The Galaxy A5 (2016) has 2GB of RAM and a 13MP rear camera and 5MP front camera. 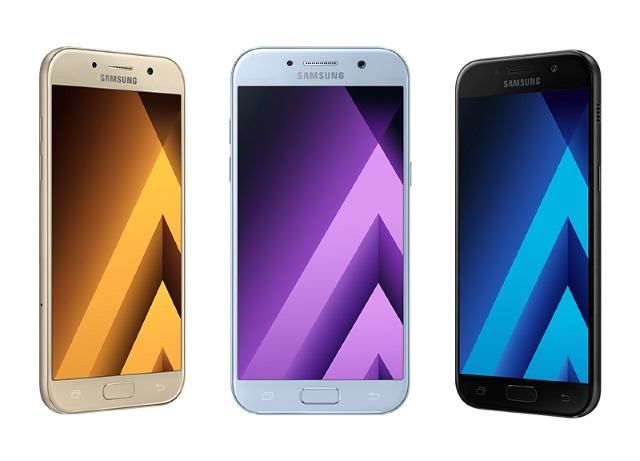 The Galaxy A5 is in the middle when it comes to comparisons between the three phones. It is better than the Galaxy A3 and while it has some of the specs from the Galaxy A7, it is not as powerful or big. Pre-orders for this phone will also begin on January 20. The Galaxy A7 is the biggest and most powerful of the three phones announced by Samsung a few days ago. The phones has a 5.7-inch display, 3GB of RAM, 32GB of storage and a 3,600 mAh battery. The cameras are the same from the Galaxy A5, 16MP rear camera and a 16MP front camera. Like the other two phones, the price has not been announced but it is rumored to be around $500, $60 more than what is rumored for the Galaxy A5 and $170 more than the Galaxy A3. The phone will be available for pre-order on January 20. There are also a few similarities between the three phones. One of them is that they all have expandable memory up to 256GB. All three have fingerprint scanners on the home button. They also run Android 6.0 Marshmallow, which isn’t the latest version of Android but the phones will probably receive the update some time in 2017. The Galaxy A3, Galaxy A5 and Galaxy A7 also support fast-charging and have a USB Type-C. They also have an IP68 rating, which means they are water and dust resistant. The color options for the three phones are: Black Sky, Peach Cloud, Gold Sand and Blue Mist. Samsung’s newest phones may not be the Galaxy S8 but they have caught the attention of many for being midrange phones that look a lot like their flagship phones. Samsung began the year with three new phones but its biggest unveiling could be in a few months as the Galaxy S8 is rumored to be coming in April. Recent rumors have mentioned that the phone will not make an appearance at MWC (2017) but a few other tech sites have reported that the Galaxy S8 should appear in the first quarter of 2017. The Galaxy A3, A5 and A7 will be available for pre-order on January and while an exact release date has not been revealed, it has been reported recently that the phones will be released some time next month. We’ll keep you updated on the latest news for the Galaxy A3, A5 and A7.